NEW YORK (AP) - Some 80 years ago, the Nazis forced prominent German Jewish art gallery owner Max Stern to sell his family’s roughly 400-piece collection before he was exiled from his country. FBI agents on Wednesday returned one of those works, a 17th century oil painting by a Dutch master, to representatives of the Dr. and Mrs. Max Stern Foundation during a ceremony at the Museum of Jewish Heritage in New York. 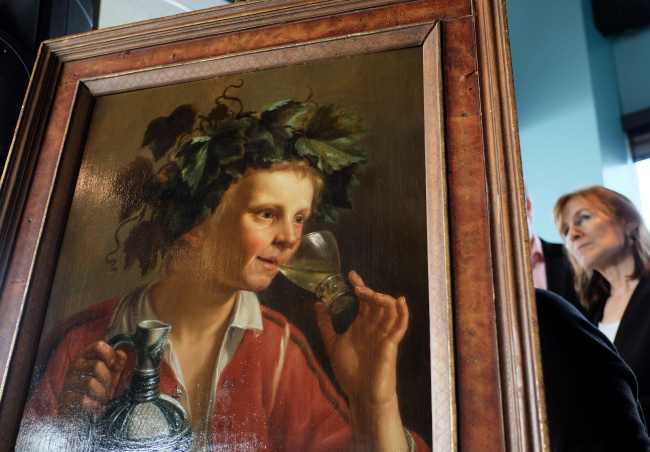 The recovery of Jan Frans Verzijl’s “Young Man As Bacchus’’ marks the 16th piece of Stern’s collection that investigators have been able to return to the foundation since recovery efforts began in the late 1990s. While the painting had survived several generations of exile,” it was seized by agents at a New York City art fair in 2015 after Italian gallery owners unaware of its past consigned it for sale, said Michael McGarrity, who heads the FBI’s New York field office. In 1936, the Nazis forced scores of Jews such as Stern to liquidate their assets, including art, at a fraction of their values because of their heritage, an act that US courts have since ruled amounts to theft. Recovering the art has been a painstaking process, in no small part because the art world is notoriously secretive and many current art owners inherit pieces from older generations, sometimes unaware of their provenance, experts said. Laws recognizing the theft also vary among countries, and artwork sometimes doesn’t emerge into public view for decades, they said. Stern was exiled in December 1937 and eventually made his way to Montreal, Canada, where he became a prominent art dealer. Upon his death in 1987 he bequeathed his assets, including his ownership of recovered artwork, to the foundation and its three beneficiaries: Concordia University and McGill University in Canada and Hebrew University of Jerusalem in Israel.